Derby Academy is celebrating students’ efforts after placing first at the 2019 New England Regional Future City Competition at Watertown Middle School on January 26. 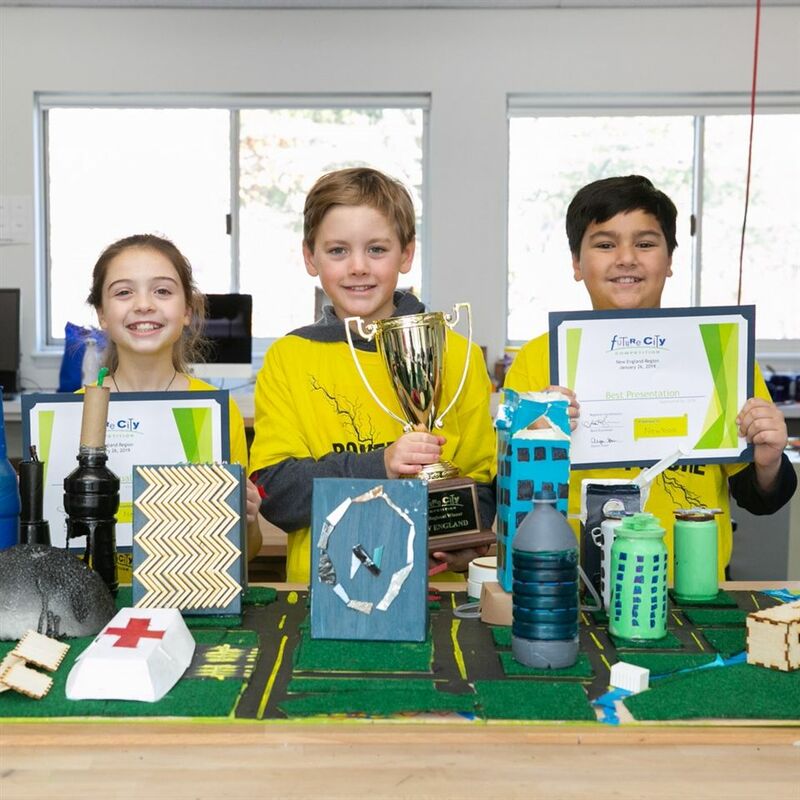 Derby Academy Grade 6 students Axel Fernando, of Cohasset, Colin Fitzgibbons, of Duxbury, and Penelope Tregoe, of Hingham, earned first place in the regional round that tasked students to imagine, design, and create a city that exists at least 100 years in the future. Their group, Newtopia, also earned Best Virtual City and Best Presentation out of the twenty-seven teams from around New England. Derby Academy Grade 6 students Carson Arevian and Ava Thomas from the group Silver Bay earned third place in the overall competition; another notable achievement. Since September, students had been utilizing city-planning software to research, design, and plan innovative, age-friendly cities that considered solutions for a resilient power grid that can withstand and recover from natural disasters while minimizing power disruption. Presenting their designs to family, faculty, classmates, and a panel of judges from the Boston Society of Civil Engineers (BSCES), teams were judged and scored on sustainability, energy use, transportation, water resource management, and population distribution. In small teams, students produced a virtual city, a 1,500-word research essay, a 3D scale model, and a formal presentation; deliverables that documented the team’s journey through the entire engineering design process that required substantial time and project management, collaboration, and imagination. Derby Academy faculty member and STEM Curriculum Specialist Kathleen Malone reflected on all the students’ sustained efforts over the last several months, recognizing the hard work, focus, and dedication required to get to the regional level, all the while competing against several other prestigious schools in the area. Congratulations to Axel Fernando, Colin Fitzgibbons, Penelope Tregoe, who will be representing New England and Derby Academy at the Future City Finals in Washington DC this February. Click here for complete listing of all the 2019 New England Regional winners.